Readers have been demanding a review of the Core i7 SKU of the latest XPS 15 9570. Expect our full take on the system and how it compares to the Core i5 SKU next week! Meanwhile, our page on the Core i9 SKU should be coming in the month ahead. 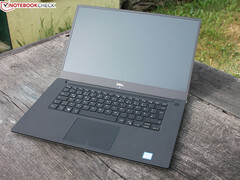 Dell XPS 15 laptops are often seen as Windows alternatives to the spazzy Apple MacBook Pro 15 for good reason. Despite sporting a three-year old chassis, it's arguable that competing OEMs have yet to launch a Windows laptop that balances rigidity, design, and overall impression as well as Dell's flagship XPS series. Our first look at the base Core i5 configuration of the XPS 15 9570 revealed excellent CPU and GPU performance marred by driver issues related to the GTX 1050 GPU. Its hot temperatures both inside and out have unfortunately not improved over the last generation XPS 15 9560. Now that we're finally testing the Core i7-8750H configuration, we can compare how the same chassis can hold up when equipped with an even faster CPU. Will the Core i7 SKU throttle more heavily to keep temperatures in check? Has Dell finally addressed all the driver concerns a full four months after the initial launch? Of course, we'll share our experiences before the end of the month when our tests are completed. As for the Core i9 SKU, we expect to have a unit in the coming weeks with our published results sometime in October. According to Dell, there will be some upcoming performance tweaks specifically for the Core i9 SKUs that we are eager to test and show in our analyses.